by Marvin A. McMickle. Judson Press, 2010. What is the role of Deacon in the Black Church? Marvin McMickle, pastor of Antioch Baptist in Cleveland, Ohio, provides some straight-forward and helpful answers to that question in this helpful book endorsed by the National Baptist Convention. He begins with a discussion of the Biblical understanding of the role of deacon and uses this as a springboard for conversation about the personal characteristics deacons should possess. This is followed with a conversation about the historic role of deacons in the Black Baptist Church and a lively discussion about the controversy surrounding women deacons and how one congregation went through the process of selecting its first woman deacon. McMickle includes results of a survey of the role of deacon in the church and sets out a strategy for training and supporting deacons in their service. 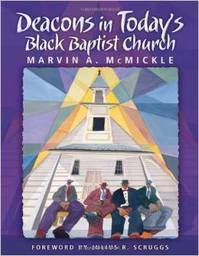 A unique feature of the book is a concluding chapter comprised of profiles of several deacons of various ages who have served or are currently serving in Black churches.